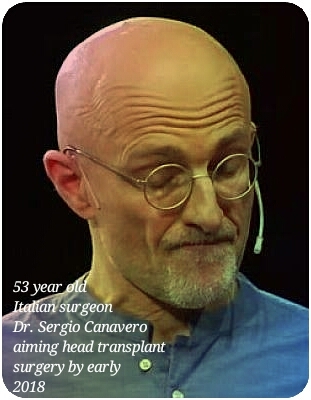 Musings 'n scribblings of a philanthrope .. : Future head transplant by Italian surgeon Dr Sergio Canavero ..
Future head transplant by Italian surgeon Dr Sergio Canavero ..
At first I thought this was an April Fool's joke being played on the people of the world, but later I realised it is really a surgeon trying to convince the world of the success of such a surgical process from his limited knowledge and exposure ..
By June 2015, Dr. Canavero was recruiting surgeons to participate in the procedure, which will be conducted on Valery Spiridinov, a 31-year-old Russian man with Werdnig-Hoffman disease, a rare genetic condition that prevents his muscles from growing. .. the Observer website .. There is a Newsweek report of the first patient of Dr. Sergio being a Chinese patient. Needs confirmation. Joining just 10 to 20% of the millions of nerves passing through the spine to the different parts of the body is what Dr Sergio says makes his intention of doing a successful head transplantation very easy.. But by doing a part shoddy work on a human patient, is Dr Sergio inviting to give birth to Frankensteins on planet earth ? Click here for the TED talk by Dr Sergio ..
His idea sounds very plain and lacks the needed academic and professional medical rigour and looks like he believes human physiology, especially the nervous system is a simple as that of rats ..
Can the civilised world get up and sensitise the people of the world as to the threat this experiment would pose to humanity as it would be akin to releasing a genie out of the bottle ?? Can there be a consensus among the medical fraternity of the necessity and ethical position regarding this head transplant ?